Bernanke extols Fed transparency–which he calls his legacy–but on numerous occasions he mentions cases where he and his colleagues hid their motives, thoughts, and actions. Why? To avoid spooking the market, to retain leverage while bargaining with banks, to allow banks to borrow without being stimgatized, etc. All good reasons, but suggesting that transparency is a more complex ideal than he lets on. While Bernanke admits some errors, they are of the minor sort–having to do with leadership and presentation. He refuses to admit the biggest one: the failure to rescue Lehman, which he continues to blame on “the law,” as I note in Slate. So the error-admitting seems more like an exercise in establishing credibility than in admitting error. Bernanke mocks the Old Testament types who want to punish financial institutions, but then expresses “anger” at AIG and ensures that it is punished. Which is it? 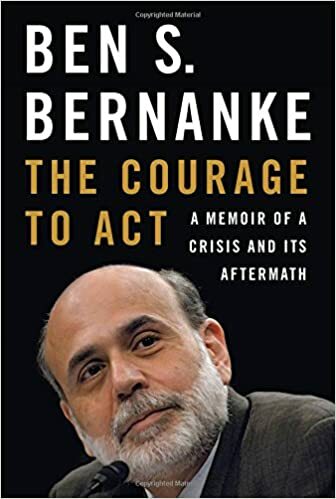 The most interesting thing I learned, or at least that I infer from the narrative, is that Bernanke wanted above all to ensure that the Fed did not take losses and pass them on to the Treasury. At the same time, he and others have criticized Sheila Bair for taking just such an approach to the FDIC insurance fund rather than focusing on the financial system as a whole. How much of the crisis response was driven by competing bureaucratic mentalities?